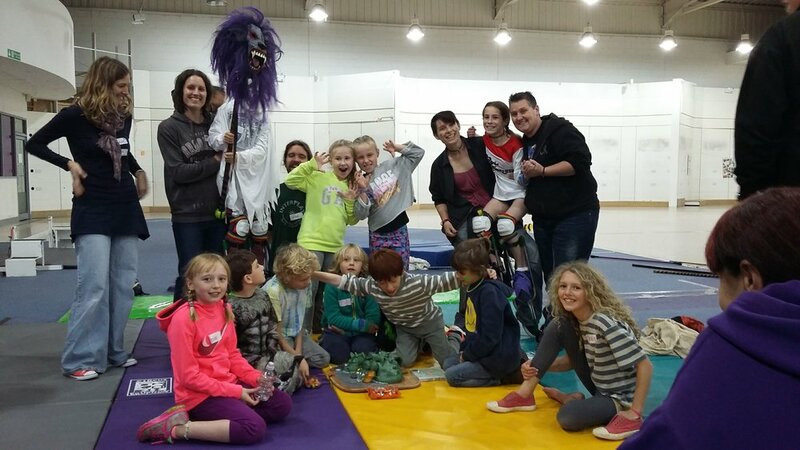 Our inclusive youth circus sessions run every TUESDAY from 7pm-9pm in the old Toys R Us building, Unit 1, North Dock, Parc Tawe, SA1 2AS. Now in to it’s second year, we are running an integrated youth circus for those aged 7-11yrs old. It is from 4:30-6pm, in the old Toys R Us building, Unit 1, North Dock, Parc Tawe, SA1 2AS. If you're interested in coming along then please get in touch. As well as our Tuesday night youth circus we also run an over 18 circus skills sharing session every Sunday morning. "Big Kids Playgroup" runs from 11-1pm. The space and equipment is available to use, and although there aren't any formal lessons in skills there are usually people around to offer a friendly word of advice. £2 per person. Please note that the trapeze rig is only available if we have trained tutors willing to volunteer. RETURNING VERY SOON - keep an eye on facebook for the latest updates!! Every other Sunday we host an opportunity for families to learn and play together. With co-operative games, skills, challenges and often an opportunity to show off your new found talents Sunday afternoons have never been such fun! Sessions start at 2pm and run until 4, there is a recommended donation of £2.50 per person. For children aged 5-13yrs and their families. Check out the facebook page for dates and more information. UNFORTUNATELY THIS GROUP IS CURRENTLY ON HOLD, BUT WE'RE WORKING ON IT!